“Telling the story of the birth of a nation is never easy. Especially if that nation is as big and diverse as India,” says Shyam Benegal about ‘Samvidhaan – The Making of the Constitution of India’. “Our founding fathers took 2 years 11 months and 17 days to frame our constitution. The story of telling how they did this has nearly taken us that much time. Samvidaan is a 10 part mini-series produced by Rajya Sabha Television that will go on air beginning March 2 at 10 AM every Sunday. Written by Shama Zaidi and Atul Tiwari from a concept by Rajya Sabha Television, the series stars Sachin Khedekar as Dr B R Ambedkar, Neeraj Kabi as Mahatma Gandhi, Dalip Tahil as Pandit Jawaharlal Nehru, Utkarsh Majumdar as Sardar Vallabhbhai Patel, Rajendra Gupta as Dr Rajendra Prasad, Tom Alter as Maulana Abul Kalam Azad, Rajeshwari as Rajkumari Amrit Kaur, Narendra Jha as Qaid-e-Azam Muhammad Ali Jinnah, Divya Dutta as Shrimati Purnima Benerji and Ila Arun as Hansa Mehta among 150 others in the series. “India is the largest democracy in the world. It has more language and ethnic groups than any other nation. Despite the diversity and its many contradictions, India has travelled a great deal as a nation. It is the Constitution of India that created the framework for a strong, vibrant and progressive nation. The inspiring story of the making of our constitution has never been attempted before. At Rajya Sabha Television our endeavour is to create programs that document contemporary history of Independent India. 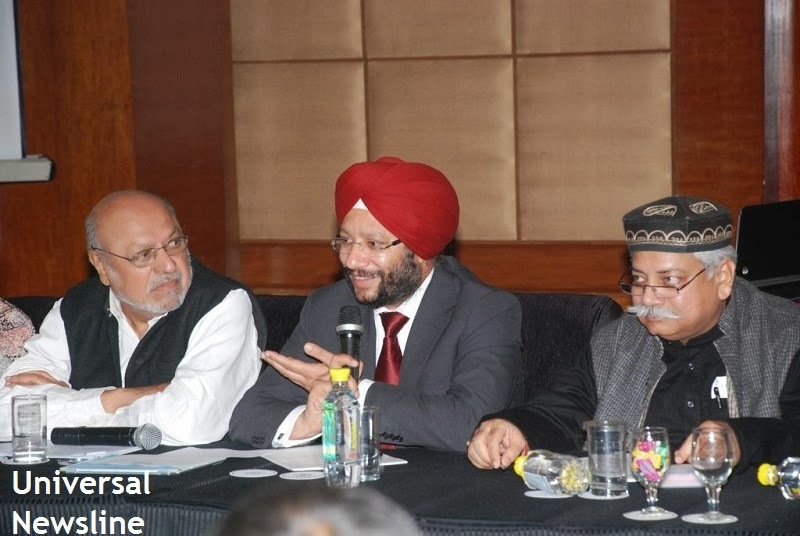 ‘Samvidhaan’ (the making of the Constitution of India) was a natural progress in this journey,” says Gurdeep Singh Sappal, CEO Rajya Sabha Television who have produced the series. After more than a year and a half of extensive research during which the writing also commenced, Samvidhaan went on the floor in August 2013. After over two months of shooting at Film City, Mumbai where the set of a replica of the Central Hall of Parliament was constructed. The action shifted to the Parliament House in New Delhi where for three weeks the crew shot extensively on its premises – for the first time that this has been allowed. “Before independence we had a feudal, hierarchical and divisive society. To root that out by looking into the future to build a constitution that can last hundreds of years was I think the greatest achievement of these 300 odd men and women who worked on the constitution and Samvidhaan is their story,” said writer Shama Zaidi. A special 23 minute curtain raiser was shown to the President, Vice President, Prime Minister and the members of both houses of the Parliament today. This special capsule was simultaneously shown on Rajya Sabha TV today as members of both houses watched Shyam Benegal’s TV venture after 25 years.